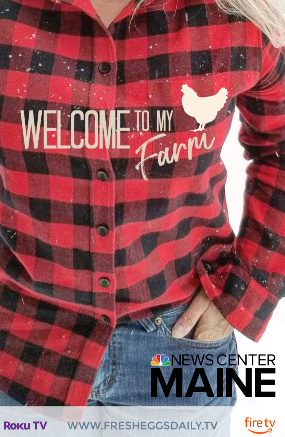 Welcome to The Great Eggscape Too. 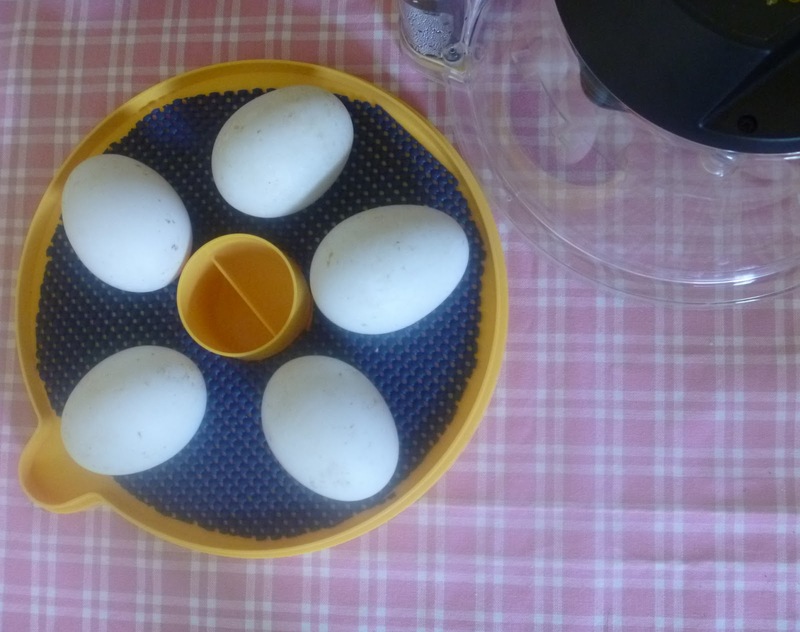 I just put six Saxony duck eggs in our Brinsea Mini Advance incubator and in 28 days hopefully we will be able to watch six ducklings hatch from those eggs! 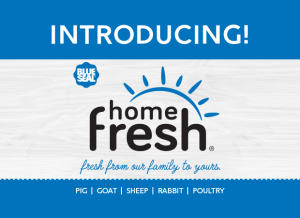 I hope you will follow along as we add to this post all through the incubation period. The eggs arrived today ! I gently cleaned off all the dirt and shavings that I could with a dry paper towel and then let the eggs sit out at room temperature for a few hours in an egg carton, pointy end down, on the kitchen counter. While I was waiting for the eggs to settle and adjust to room temperature, I candled each one looking for tiny hairline cracks that might have occurred during shipping, but they all looked great. 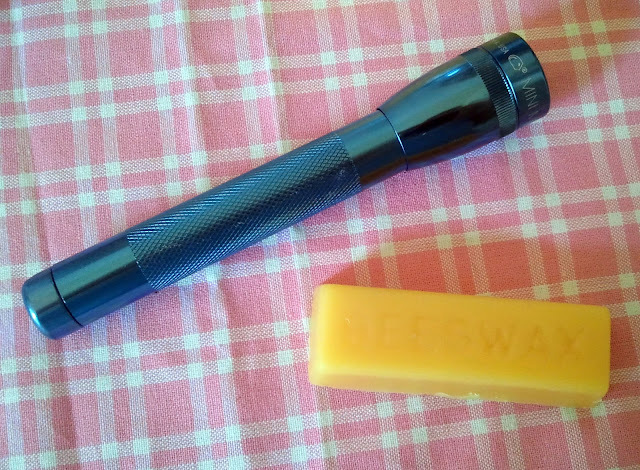 This is my candling kit: a mini Maglite flashlight and a pure beesway bar. Had there been any tiny cracks, the beeswax bar can be slightly softened and applied to the crack to seal it from air and bacteria without harm to the embryo. 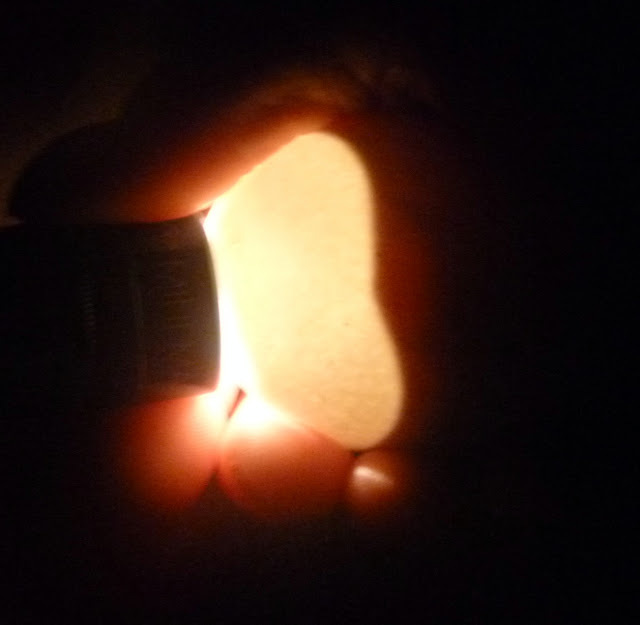 I use a regualar Mini Maglite flashlight to candle the eggs but Brinsea sells several different types of egg candlers that you can use also. 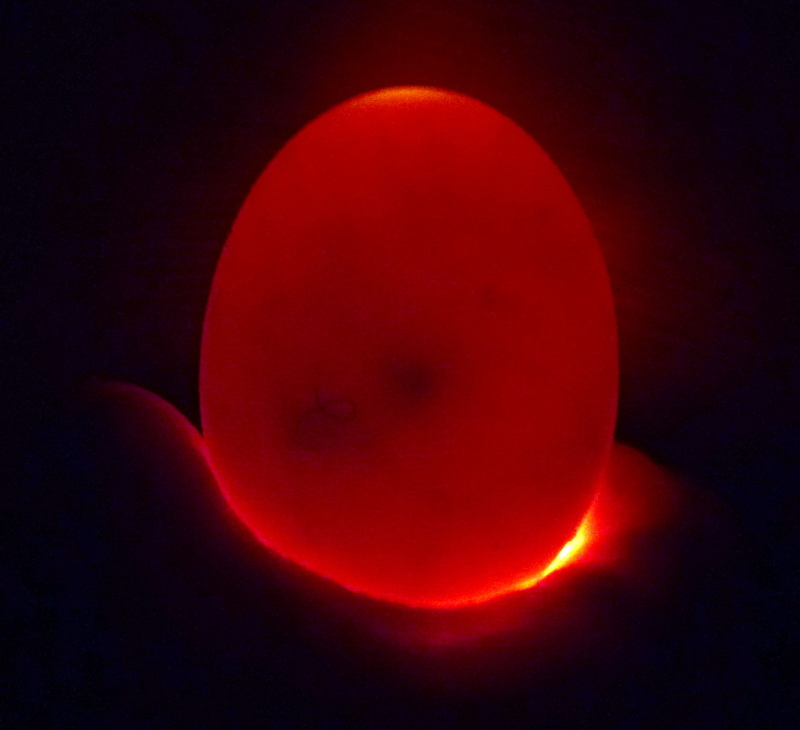 Candling merely means shining a directly beam of light through the eggshell to look for signs of development inside the egg (and also check for a blood ring which indicates bacteria has gotten into the egg and it must be discarded). I wrote a number on each egg (1-6) to be able to tell them apart. The number also serves as a reference for the daily turning. 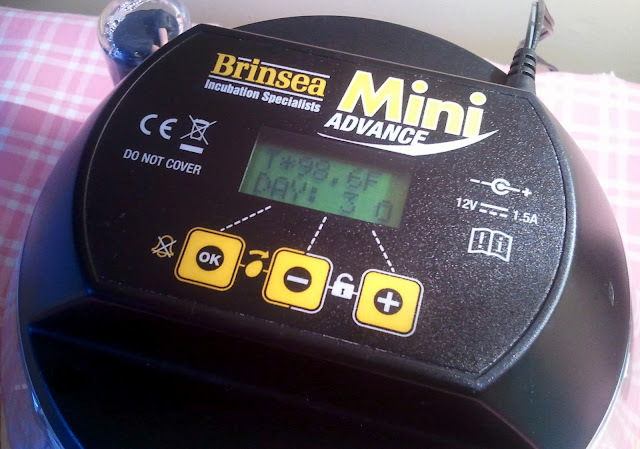 I am using the Brinsea Mini Advance incubator which will hold all six eggs, although I will have to manually turn them because they are too large for the automatic turning tray to accommodate. When the incubator was up to temperature (99.3-99.6) and the eggs had been sitting out for about 6 hours, I filled up one side of the reservoir with water. Throughout the incubation period, I will monitor it to be sure it stays filled, topping it off when necessary. This increases the humidity in the incubator and keeps the membrane inside the shell from drying out and literally shrink wrapping the ducklings. 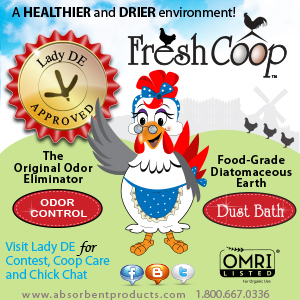 The humidity for duck eggs should stay between 45-55%, increasing to 65% when the eggs begin to hatch. 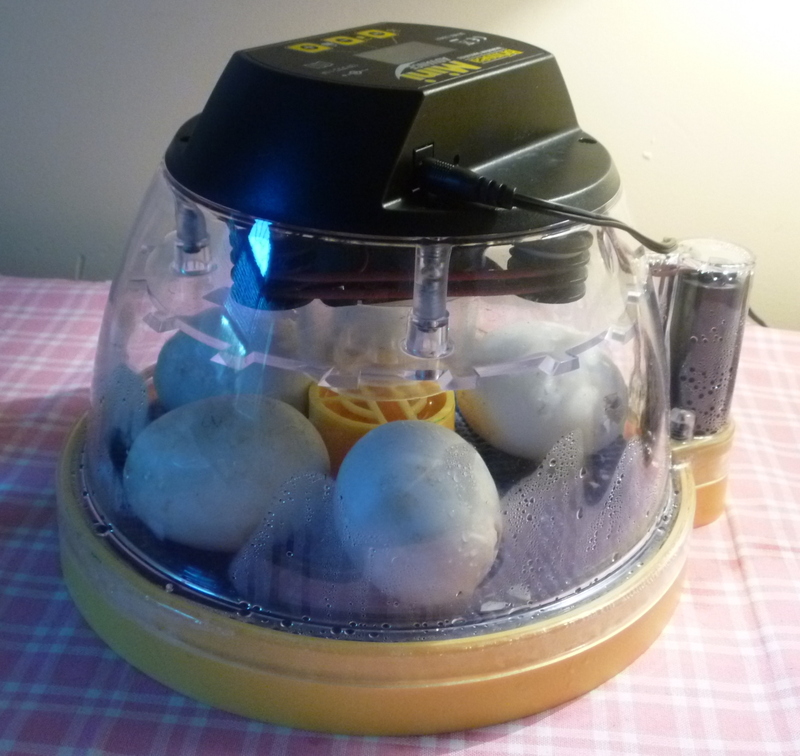 I then placed the eggs in the incubator, pointed ends facing outward, numbered sides up, on a piece of rubber shelf liner that I cut to fit. 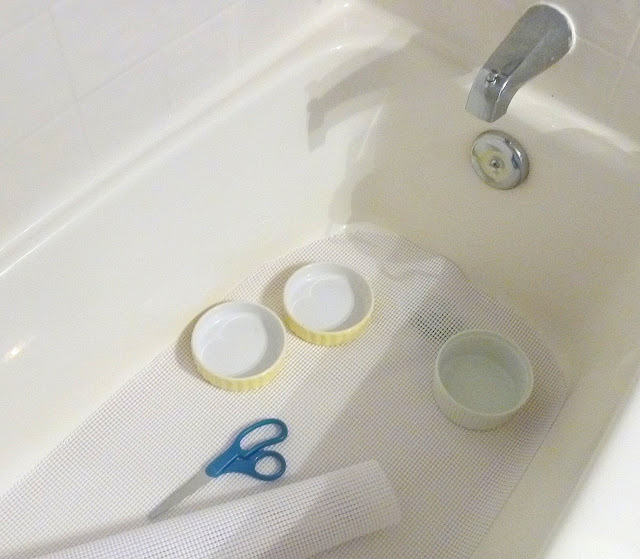 The shelf liner prevents the eggs from rolling around while being turned and also will provide a nice surface for the ducklings' feet to grip when they hatch. 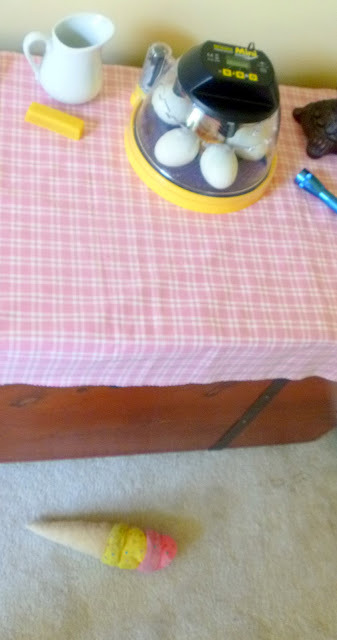 You notice I am giving equal consideration to both 'girl' and 'boy' eggs by using blue shelf liner and a pink gingham tablecloth ! Here's the 'nursery' set up with the incubator, my countdown calendar, a pitcher of water to refill the reservoir and my Maglite. I have the nursery set up in a spare room that doesn't get any traffic, is safe from our dog and cat, and stays a fairly consistent temperature. 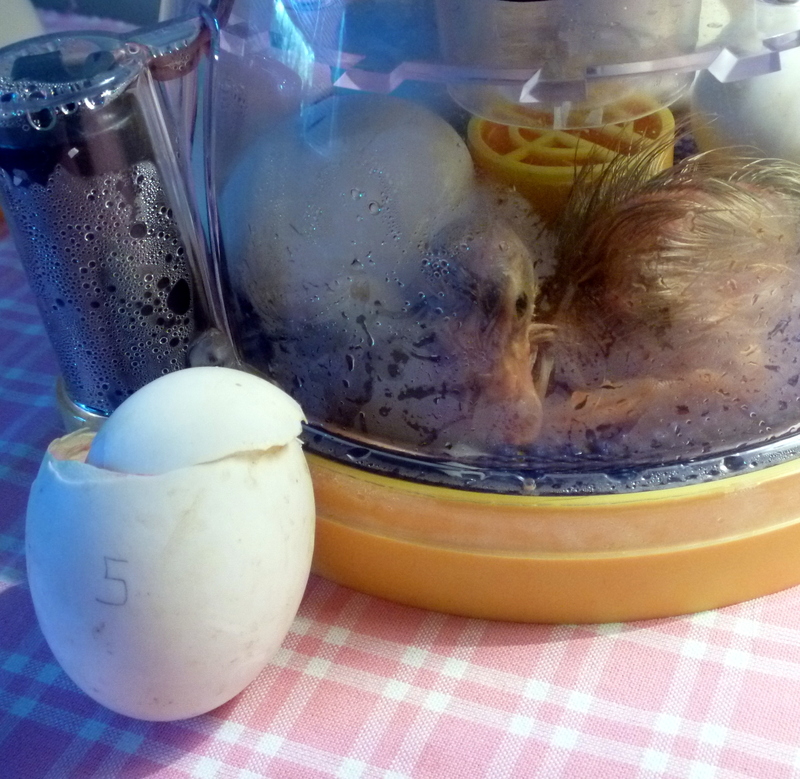 The incubator is set up away from a sunny window to avoid overheating. According to my calendar, on June 28th we should have some baby ducklings 'eggscape' their oblate cocoons and emerge into the world ! 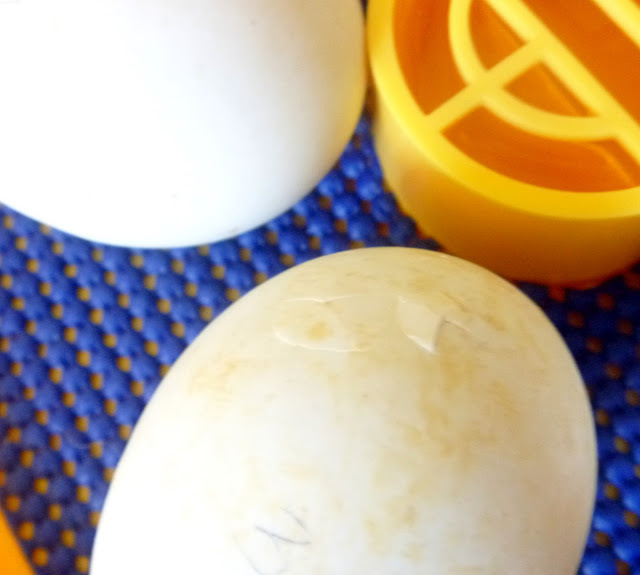 I turned the eggs this morning at 6am when I woke up - a 180-degree turn so the numbers are now on the bottom. I will turn them at 6am, 10am, 2pm, 6pm and 10pm every day, turning each a 180-degree turn each time. 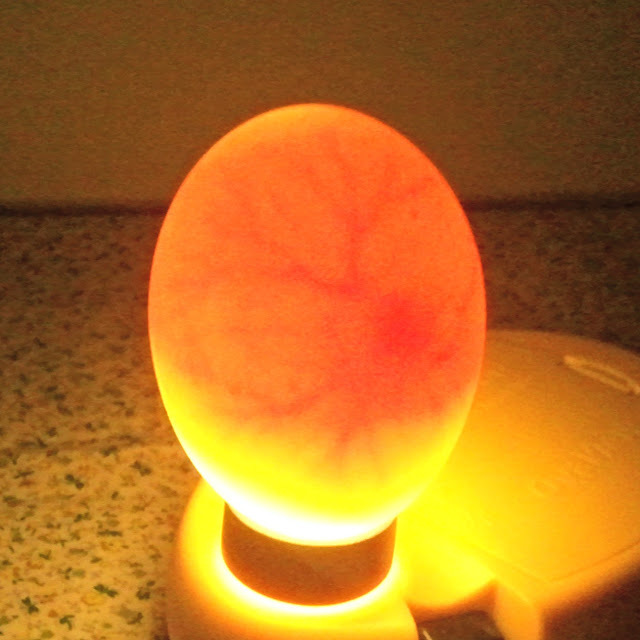 An odd number of turns each day ensures that the egg spends every other night face up. This is important so that the developing embryo doesn't stick to the membrane and shell. 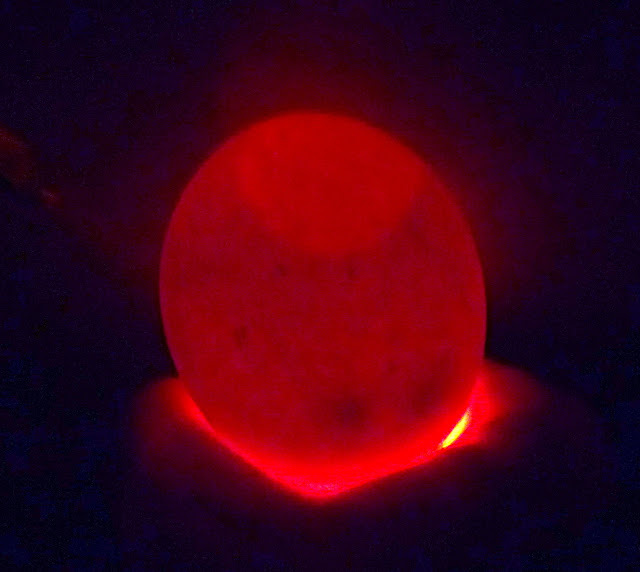 The embryo floats so will rise to the top each time the egg is turned. It's important to wash your hands before and after handling the eggs. The egg shells are porous and bacteria can easily be introduced through the shell which will kill the baby duckling. Also careful handling is important so the eggs don't get dropped. Today is the day to begin misting the eggs. There are two schools of thought on misting, but first I'll explain the concept. Misting the eggs with warm water (100 degrees) draws out moisture from the eggs and promotes the growth of the air sac which gives the growing embryo room to expand and also prevents the duckling from drowning when it is time to hatch Using warm water ensures that any bacteria is drawn out of the egg also. Just a regular spray bottle filled with warm water and a quick spritz once a day is sufficient. This is thought to mimic the wet mother duck returning to the nest after getting something to eat and drink and maybe a quick swim. The cooling effect of the evaporating water also serves to cool the egg down. That brings me to the second school of thought. Misting has the potential to draw bacteria from the outside of the shell (since the hatching eggs aren't washed) to the inside which can kill the embryo. 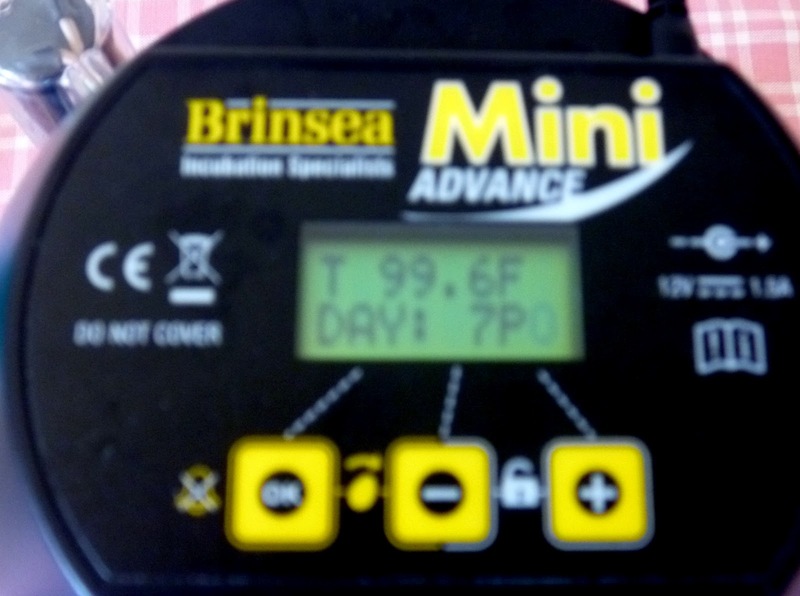 Read more HERE from the Brinsea website on this topic. While lowering the temperature of a hatching egg merely slows down the embryo's growth, raising the temperature just a few degrees for even a few minutes can kill the embryo. 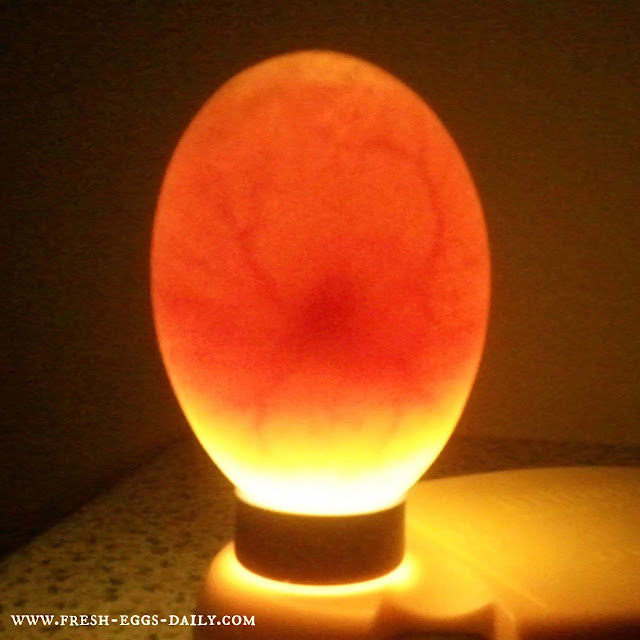 Care should be taken while candling not to leave the light against the shell for too long, while taking the eggs out to candle them can actually be beneficial. Misting and turning, day three has been uneventful. 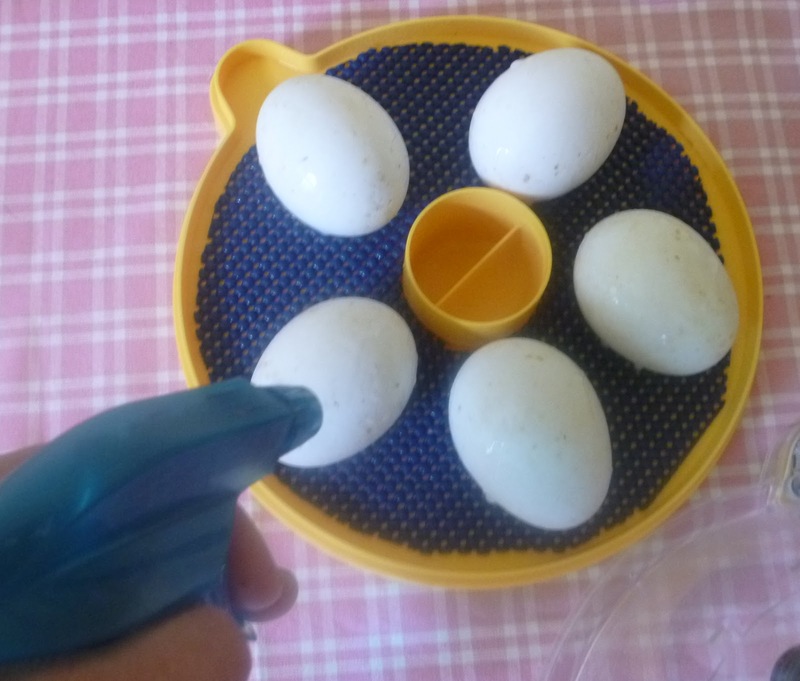 I did heat some water in my teakettle and then let it cool down to 100 degrees before misting the eggs, but discovered that if I let our tap run long enough the water does get up to 100 degrees, so in the future, I will just use hot tap water to mist the eggs. I'll take this opportunity to tell you a bit about the history of the Saxony duck. 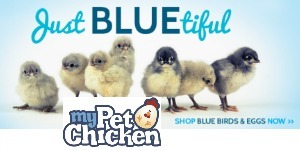 The breed was developed in Germany in the 1930s by crossing the German Pekin and Rouen breeds with Blue Pomeranians. Nearly all the Saxony stock was lost during World War II but breeder Alfred Franz managed to recover the breed by 1957. 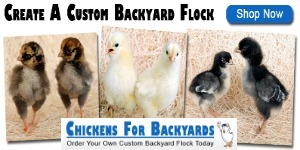 Some Saxonies were imported to the United States in 1984 by David Holderread (who later developed the Golden Cascade breed) and admitted to the American Poultry Association (APA) in 2000. 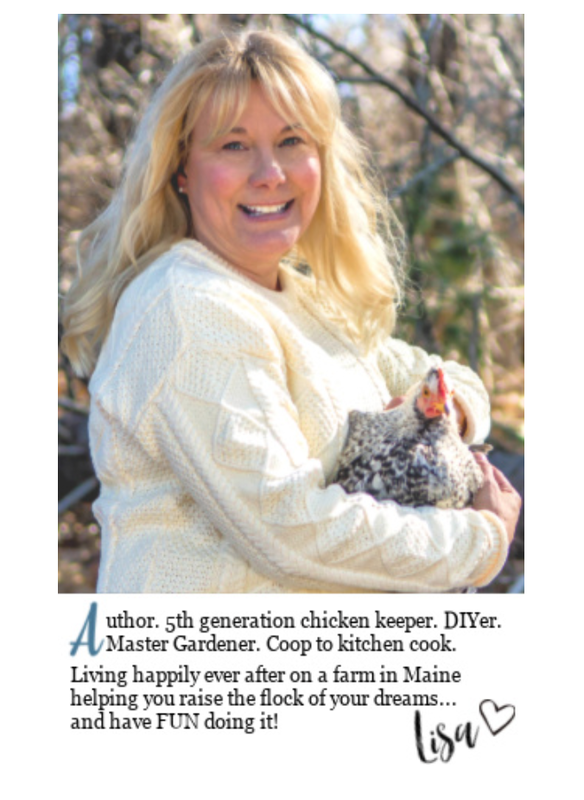 The breed is considered endangered and on the critical list of The Livestock Conservancy, a nonprofit organization working to preserve all different endangered breeds of livestock, of which Fresh Eggs Daily is a member. 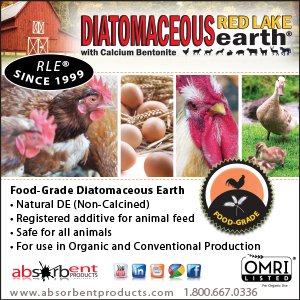 Saxony ducks weigh approximately 6-8 pounds and lay roughly 200-240 white eggs per year. 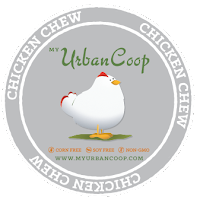 While not especially broody, they are considered to be calm, good foragers and easy going. Drakes have a typical mallard patterning, but the colors are more muted - blue-gray,chestnut-burgundy, cream and white, while the ducks (or hens) are a buff or peach color with white facial stripes. Both males and females have orange beaks and feet. Turning and misting the eggs - turning every 6 hours and misting once at noon. Tomorrow I will candle them! I'm very anxious to see if there seems to be any development inside. Today is candling day. 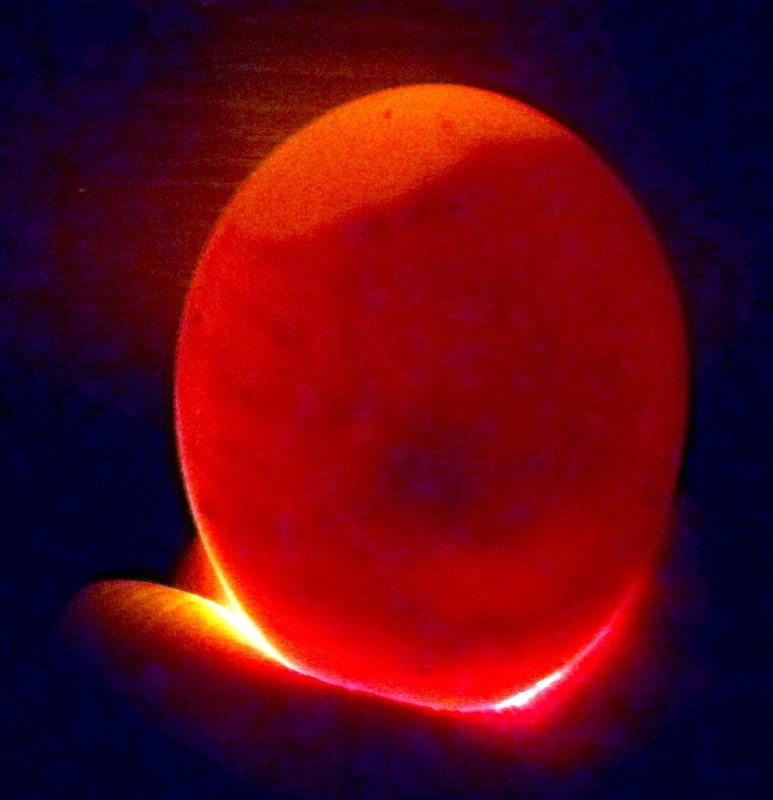 Candling merely means shining a directed beam of light through the eggshell to see if the embryo is developing. 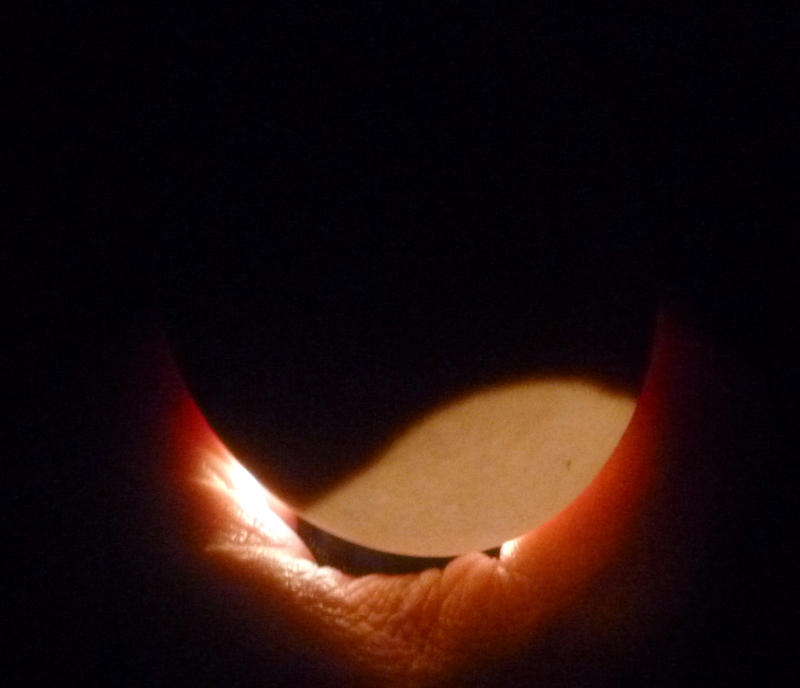 Originally a candle was used to shine the light, hence the term 'candling'. Brinsea sells an OvaScope that makes the job easy, but a small strong flashlight works also. I use a mini Maglite. 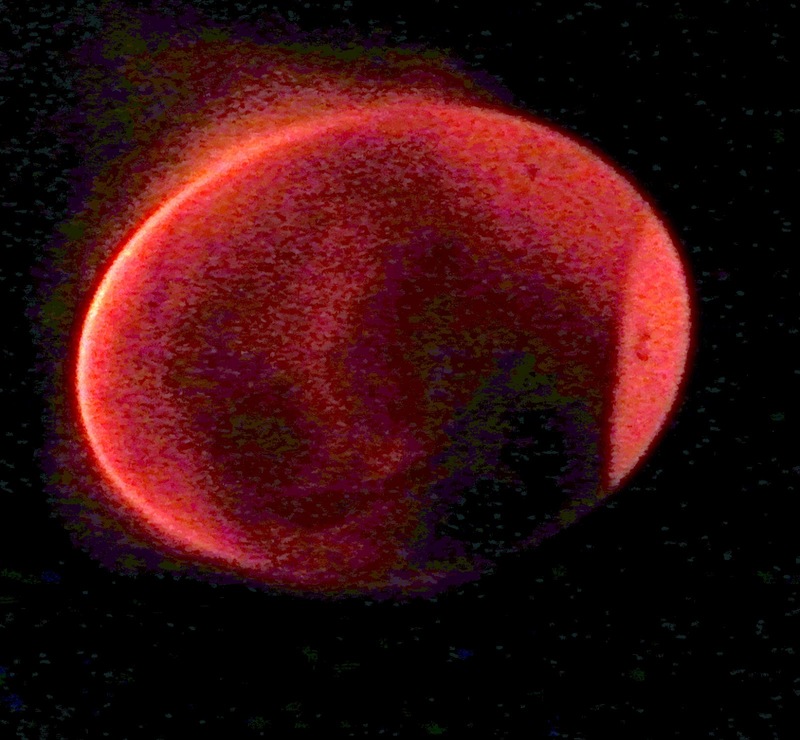 Just be sure to not hold the light against the shell for too long because the heat can be damaging to the embryo. I find it easiest to candle while its dark outside and just leave the lights off in the room. 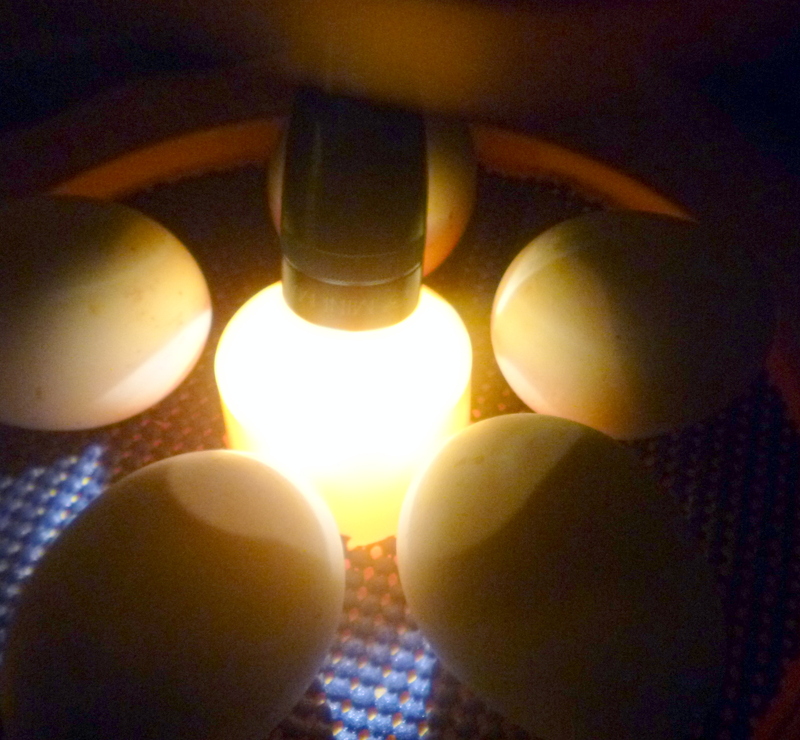 Then, leaving the eggs in the incubator, just shine the light through each one. What you are looking for on day five is the telltale 'spider' and veining. The air sac at the wide end should also start expanding. Here is an excellent Candling Chart from Metzer Farms. By day five the digestive tract, nervous system and circulatory systems have formed. The eyes, ears and brain have begun to form and the heart has started beating. 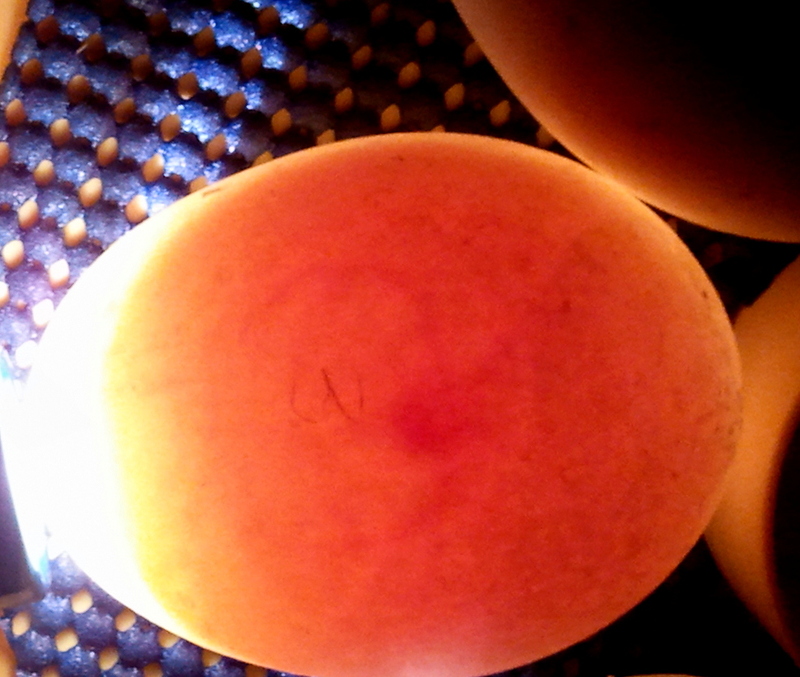 The embryo has leg bugs and the tail and bill have started to develop. This morning I candled the two eggs that I wasn't sure about yesterday and I do see the nice spidering veins in one of them and an expanded air sac in the blunt end, so it looks like I have five developing eggs. There is one egg that is much larger than the others and doesn't look that great - just a large dark blob inside. I will candle that one again in a day or so. The legs, wings and beak are beginning to form, as are the reproductive organs. I can't wait for my ducklings to hatch! 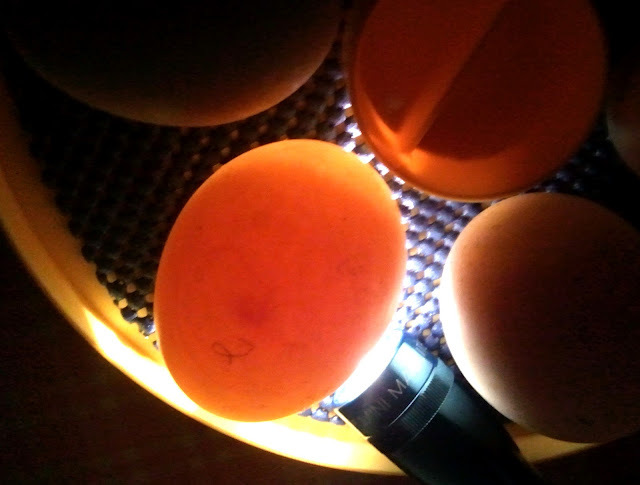 Today more of the same - turning every few hours, making sure to turn an odd number of times so the eggs spend the night on alternate sides each night. Misting at noon. I can't believe one week has already gone by. Three more weeks to go. 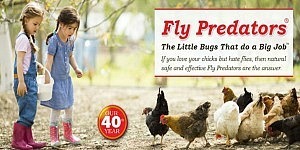 The little embryos' toes are starting to form and the legs and wings continue to grow. Really nice veining/development in these eggs! Looking good. 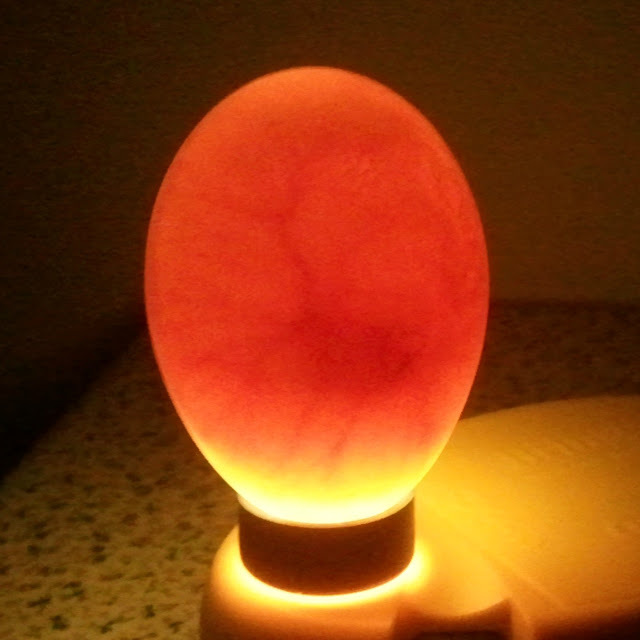 This morning I turned the eggs and candled the one larger egg. It doesn't look good. No veining, just a large blob and the air sac hasn't enlarged at all. I decided to remove it from the incubator. 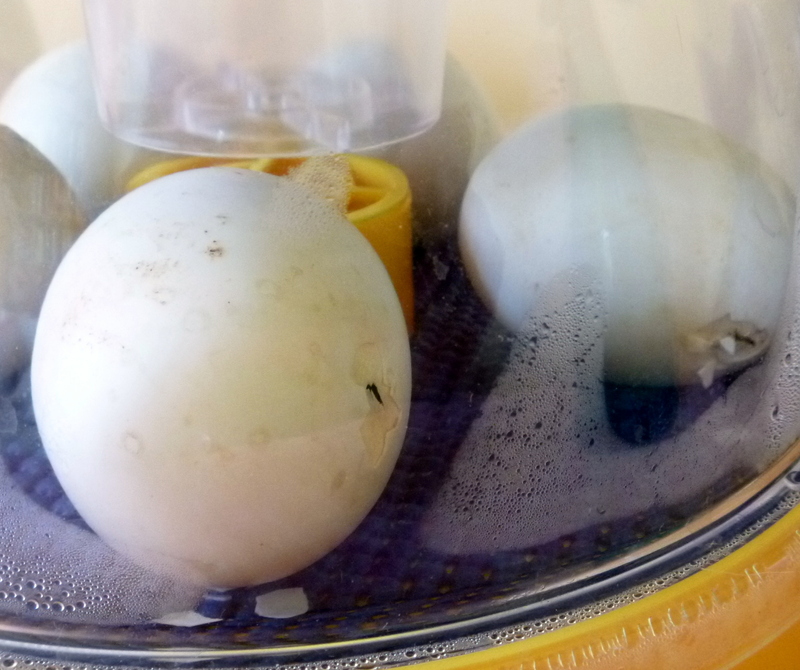 I was worried anyway that it was a double yolker - which generally doesn't result in a viable hatch - and I am afraid it will start to go bad and possibly transmit bacteria to the other eggs. So in the interest of the greater good, Egg #6 has been sacrificed. Not much exciting going on with the eggs. Just turning them every few hours still and misting them at noon. I have been topping off the one reservoir every few days, keeping it full to keep the humidity levels high. The webbing on the feet is forming today and the embryos' egg tooth is growing on the bill. 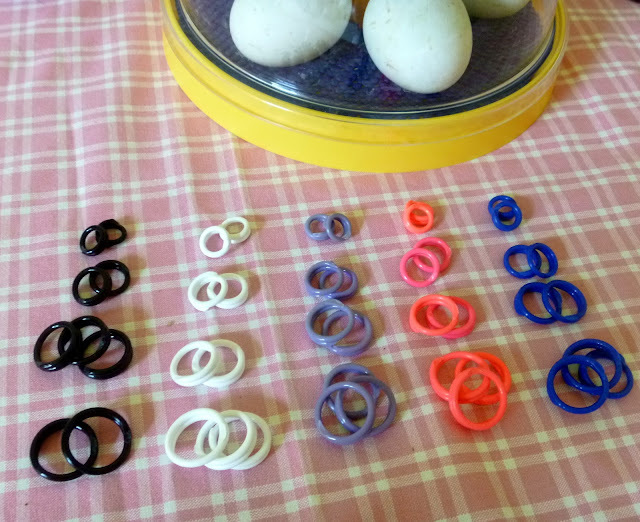 I did prepare in advance and ordered colored leg bands so I can tell the ducklings apart. I got sizes 4-12 so I can change them out as the ducklings grow. 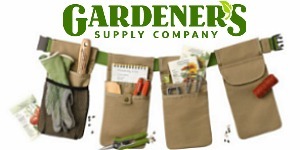 What is nice about purchasing them from there is that you can specify the color/size combination you want instead of having to buy 50 of the same size or color. 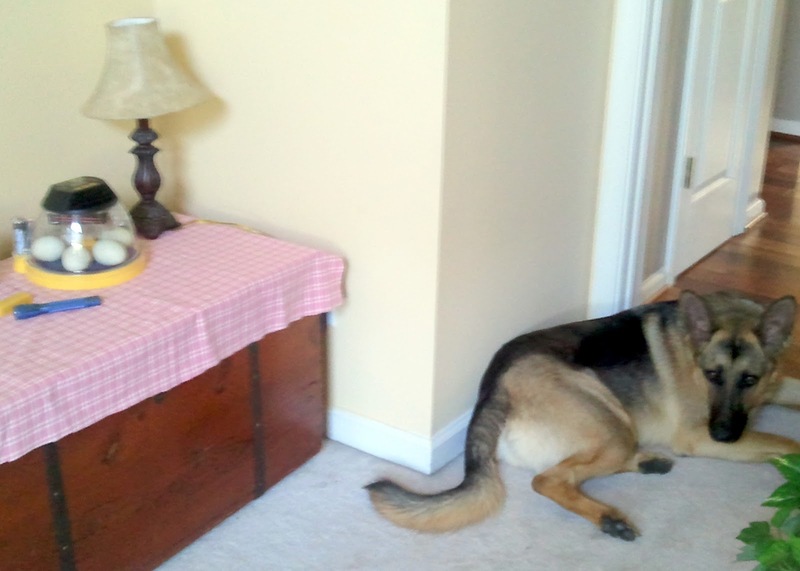 Our dog, Bella, has appointed herself the guardian of the incubator and I often find her sleeping in the doorway. She also has been leaving a favorite toy by the incubator, I assume for the ducklings to play with when they hatch ? Maintaining the status quo, turning and misting. I am thinking I should play Wagner on the CD player for the ducks since they are German! No change on the outside, but almost two weeks into the incubation period, the bill and bones are hardening. Two weeks in and all five eggs look great. Candling them tomorrow morning ! 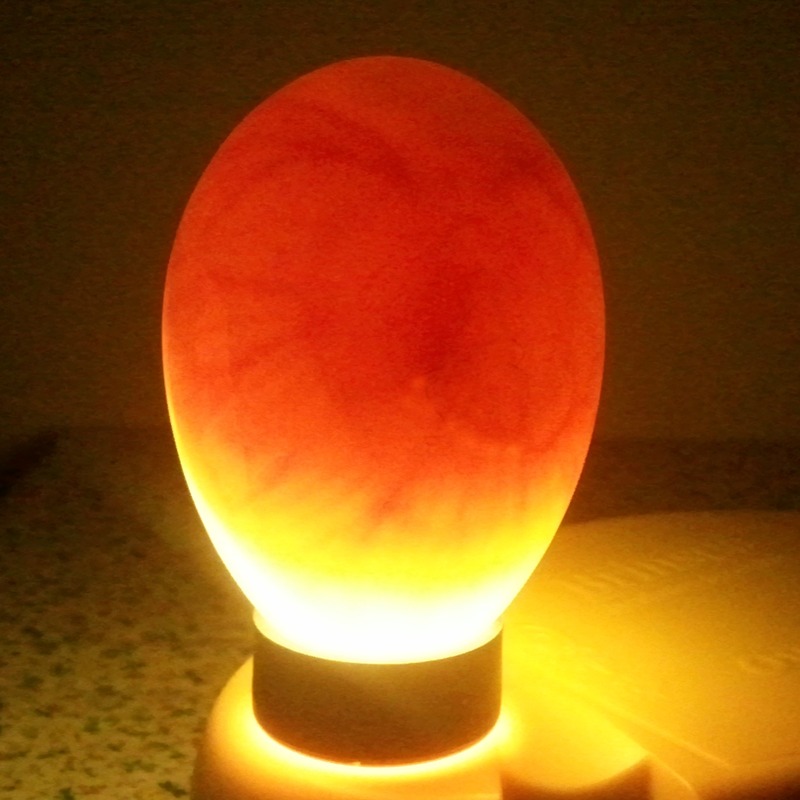 Candled the eggs this morning. They look great. I can definitely see development in all five. Then I misted the eggs and replaced the lid, which mirrors the wet mother duck returning to the nest. I will continue to do this until lockdown on Day 25. Of course I am still turning the eggs also every few hours. 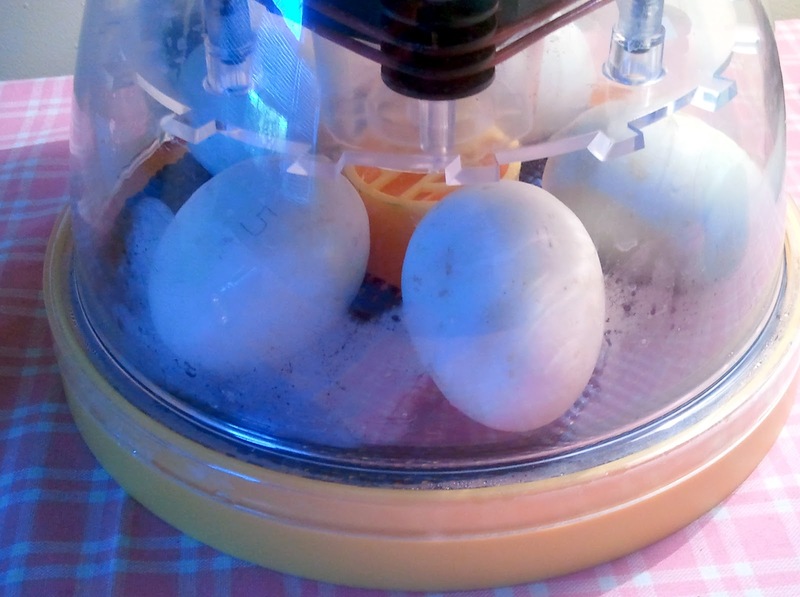 The eggs are being turned every few hours, to rest on the opposite side each night. The daily misting and cooling mimics the mother duck's activity. It might not be Mother Nature hatching these eggs, but I'm trying to imitate nature as closely as possible. and the air sacs are all expanding in the blunt end of each egg. By now the developing embryo just looks like a large dark blob. 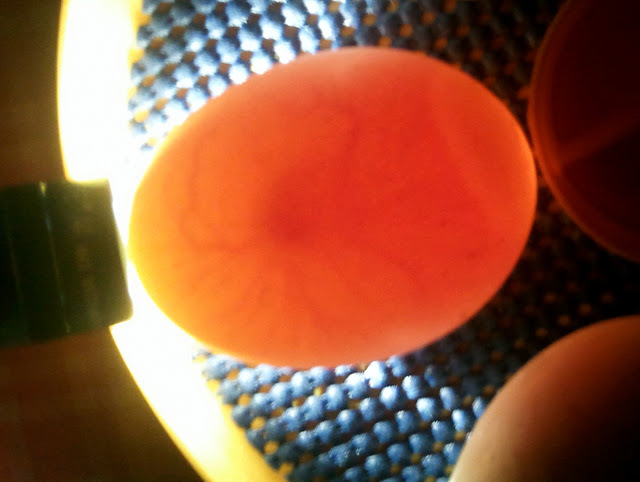 It is hard to see much of anything, but an expanding air sac is a good sign that the duckling is continuing to grow. The air sac should be anywhere from 1/4-1/3 of the egg space at this point. This has got to be the longest three weeks I can remember ! 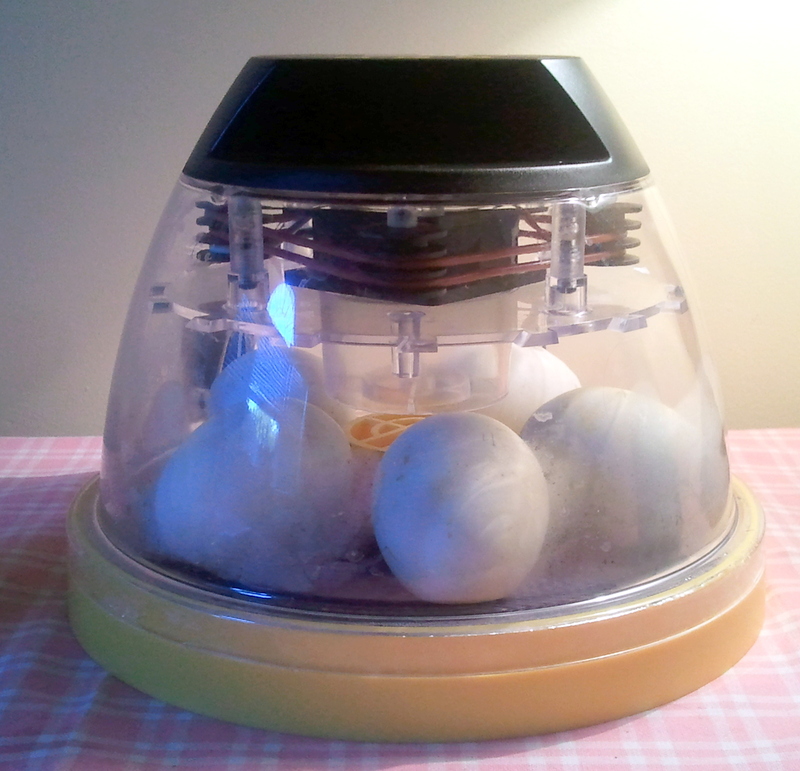 Getting impatient and anxious for the 'hatch date', I started to set up the duckling brooder. I find that a bathtub makes an excellent brooder. I line it with a piece of rubber shelf liner so the ducklings won't slip. Since they can't fly, they won't get out and a securely shut door keeps out our curious cat and puppy. Seven more days ! 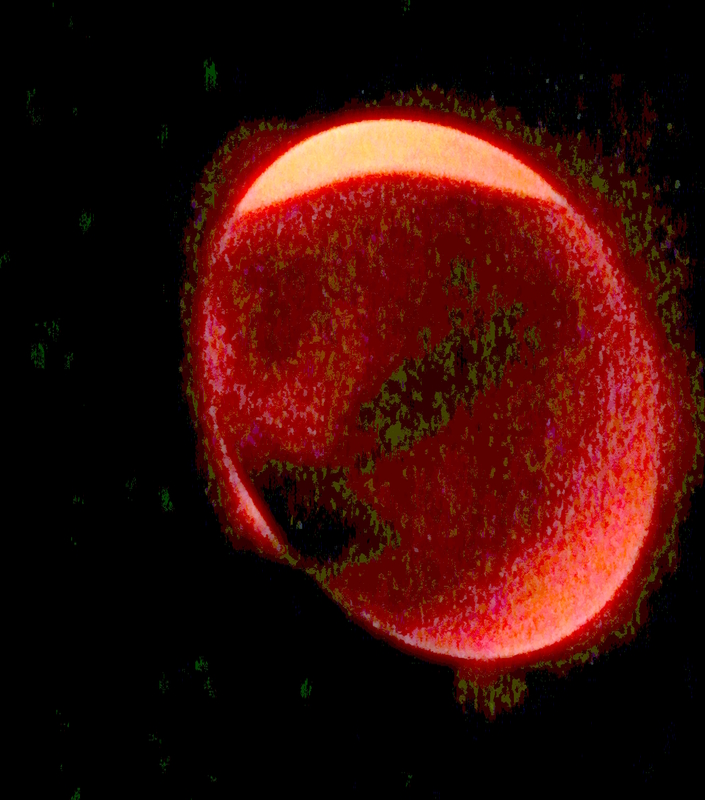 The embryos are nearly completed formed now and continuing to grow. Getting close now....just six more days left. We're getting down to the wire. 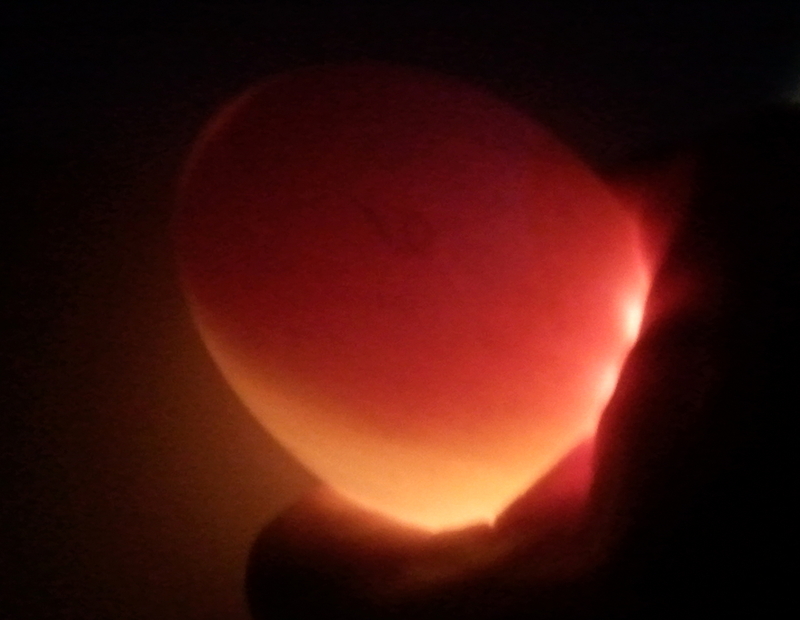 I am religiously turning the eggs every few hours and making sure they rest on the opposite side every night. 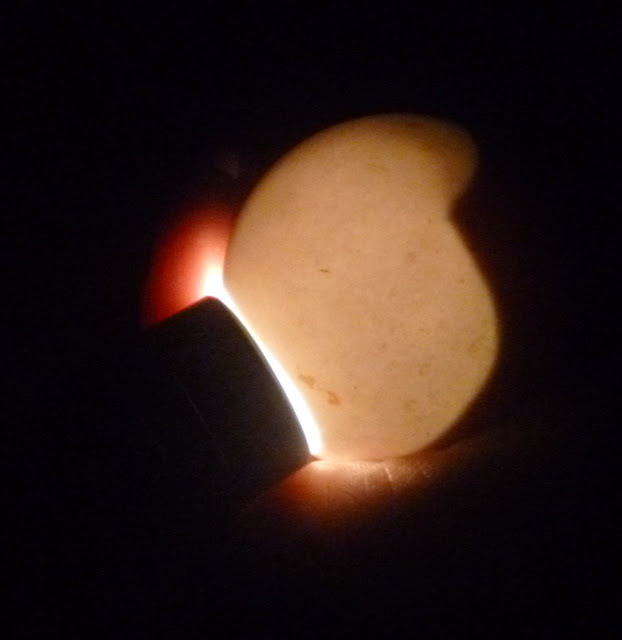 Today the egg yolk will be pushed into the body cavity of the embryo to nourish the growing duckling. I candled the eggs for the last time tonight. I could see movement inside one of the eggs ! Way cool ! And the others look good, the air sac continuing to grow and the rest a dark blob. This morning the eggs went into lockdown. One final turn, a final misting, then both water reservoirs were filled. Finally I reduced the temperature to 98.6 degrees. Now its up to the ducklings to go to work and commence hatching! The eggs will no longer be turned. 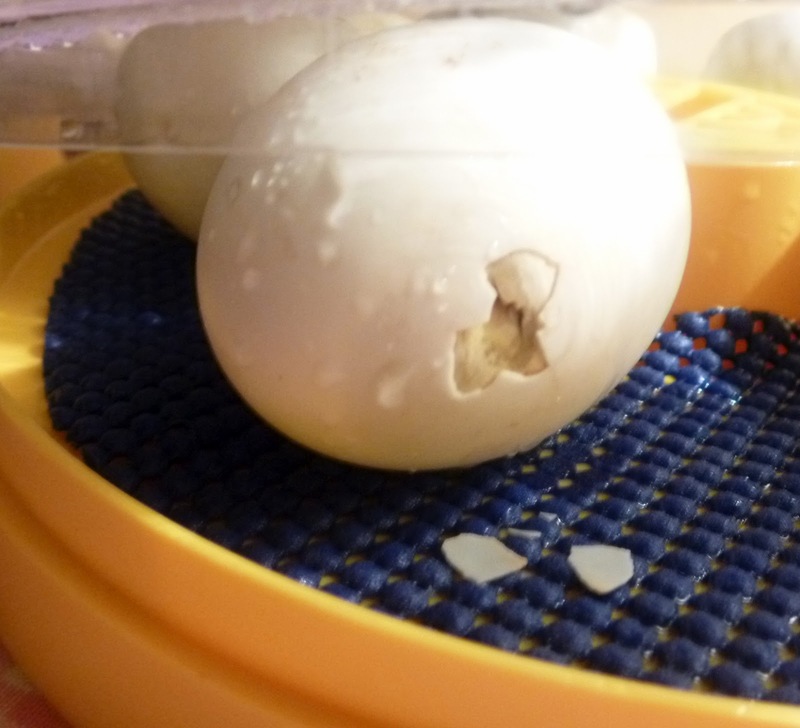 This allows the duckling to get into 'hatch position' and turning after lockdown could disorient the duckling and result in it not being able to break out of the shell. 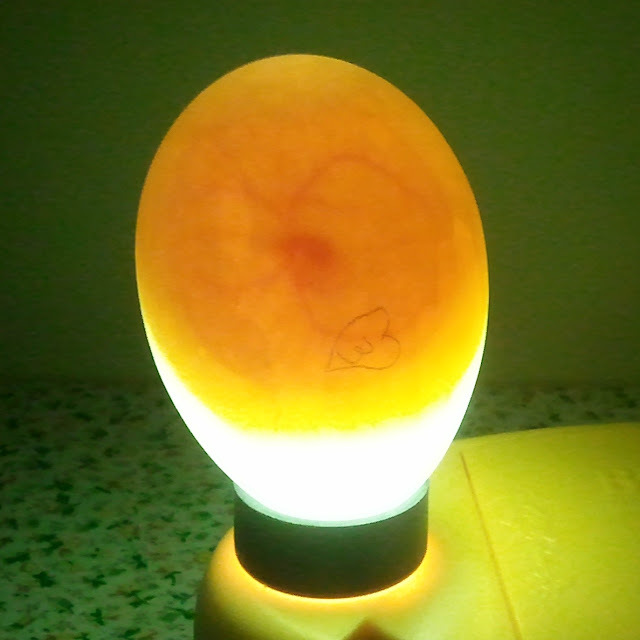 Just a hour later, condensation is visible inside the incubator. This is a good sign as a proper humidity level is important to maintain so the ducklings are not 'shrink-wrapped' in dry membrane as they try to hatch. The incubator will remain closed until the first ducklings hatch, have dried off and are ready to be transferred to the brooder. We have pipping ! 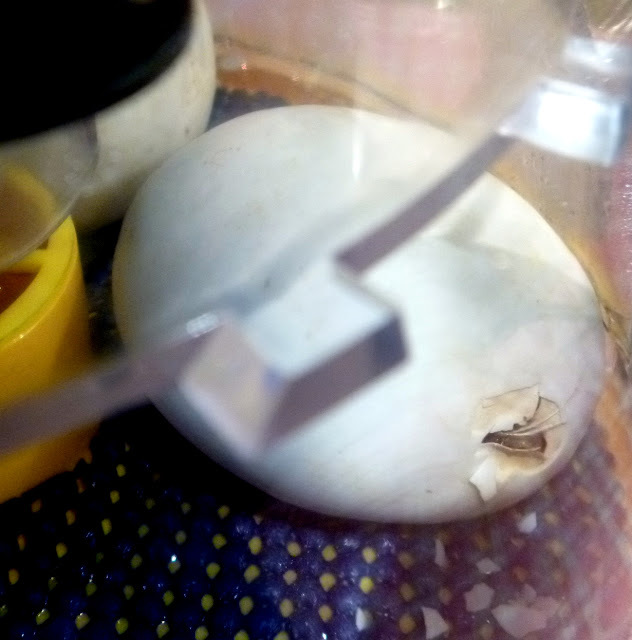 Two of the eggs have started pipping - but both from the wrong end - I'm keeping an eye on them, but hope they will be okay. One has broken through the membrane which is a good sign - that means it can breathe on its own the air inside the incubator. 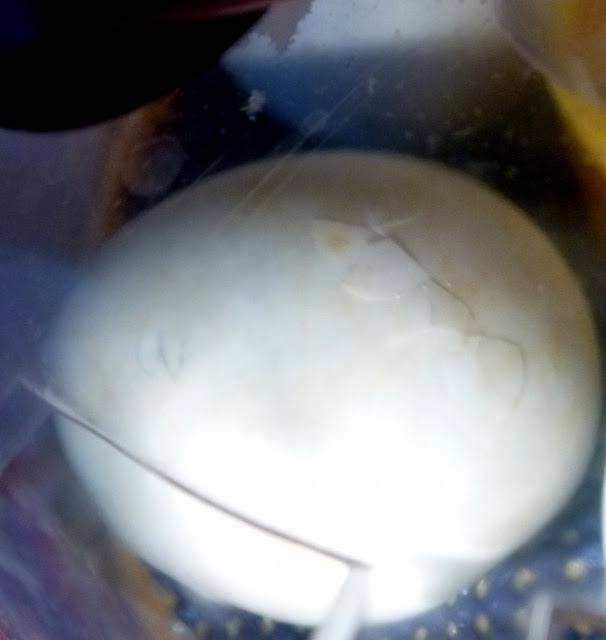 12:15pm- egg #3 has started to pip also! 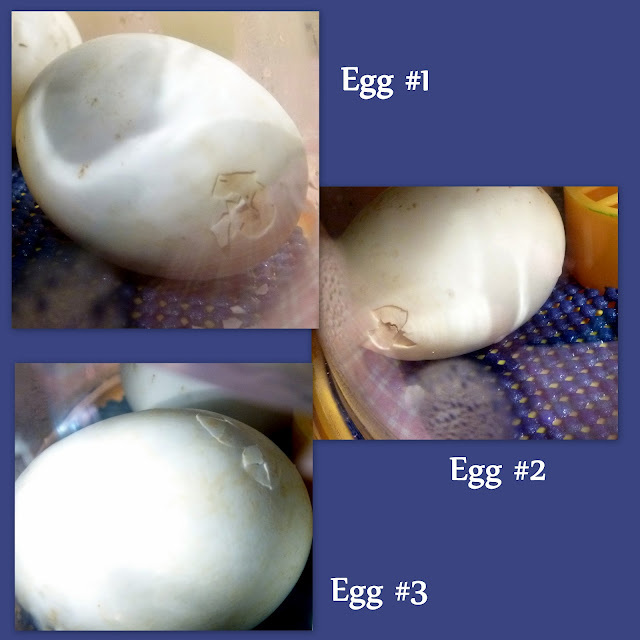 1:30pm - eggs #1 and #2 both have made a decent-sized hole in the membrane so they can breathe. 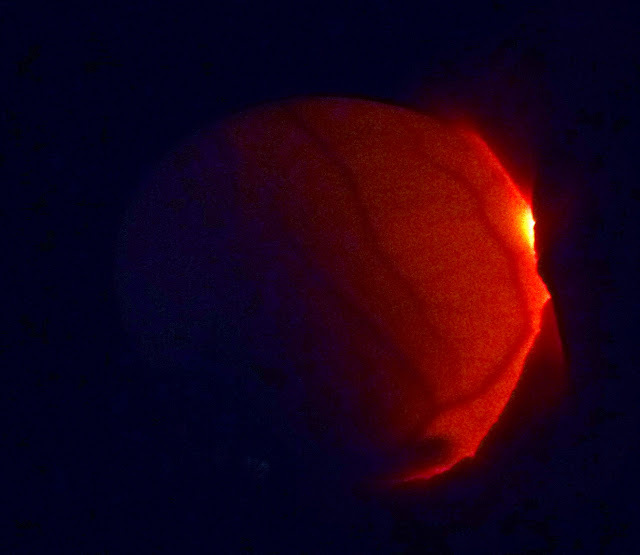 9:30pm - just three eggs of the five have pipped so far...today was a long day of watching my eggs not hatch. 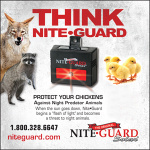 Hopefully I'll wake up to a duckling or two in the incubator tomorrow morning. I can see two breathing through the hole in the membrane and one is peeping. It was a long night, but none have hatched yet. 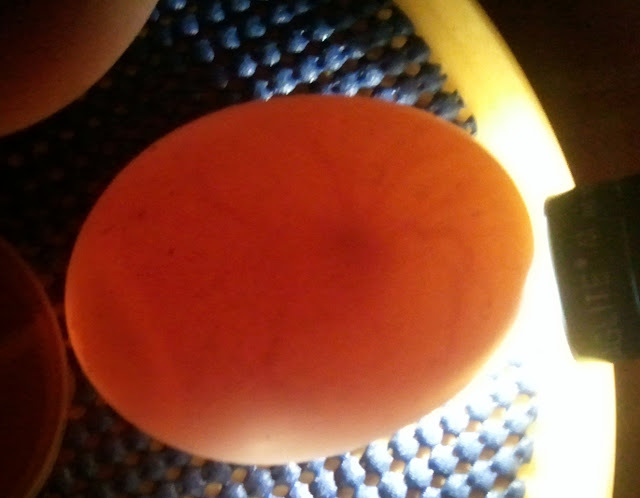 Egg #1 is peeping and I can see feathers sticking out. 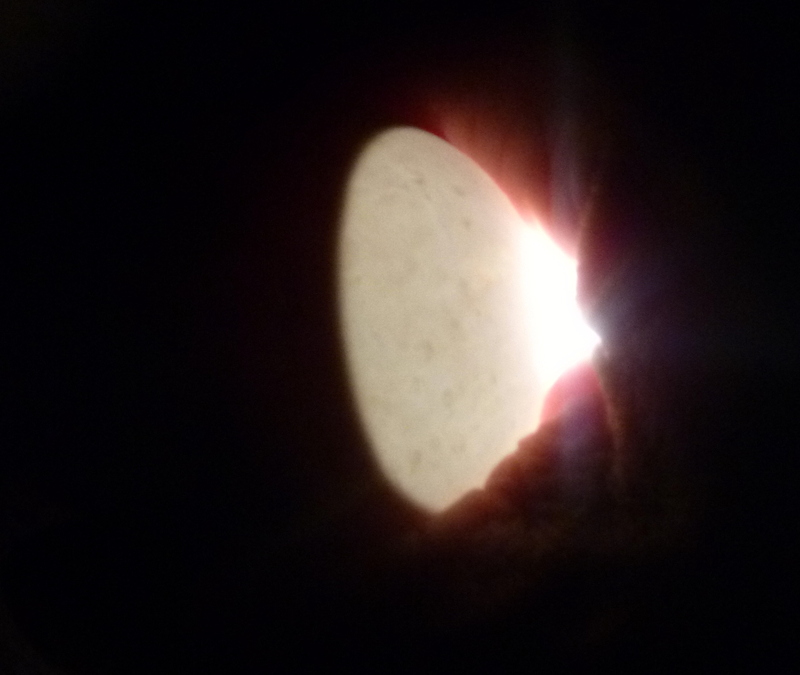 Egg #2 is breathing through the hole in the membrane. Egg #3 has started to zip. 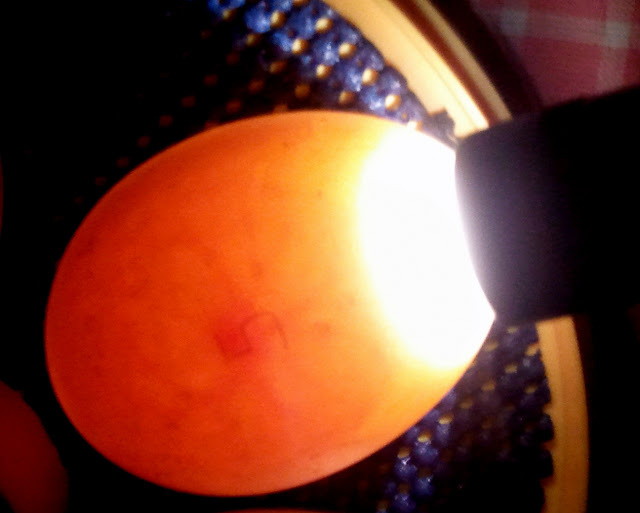 Egg #4 has just started to pip. Nothing from Egg #5 yet..but it's a long day. 8:04am - Egg #5 pipped, zipped and hatched...all within ten minutes or so. 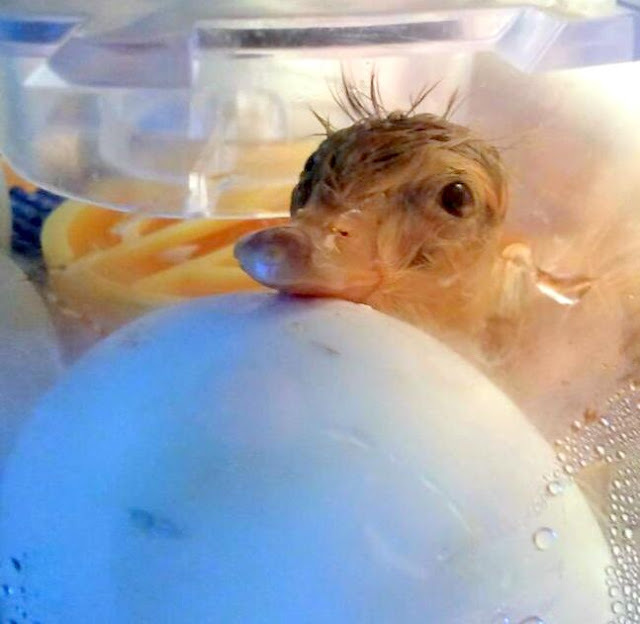 Welcome to the world baby Saxony duckling! 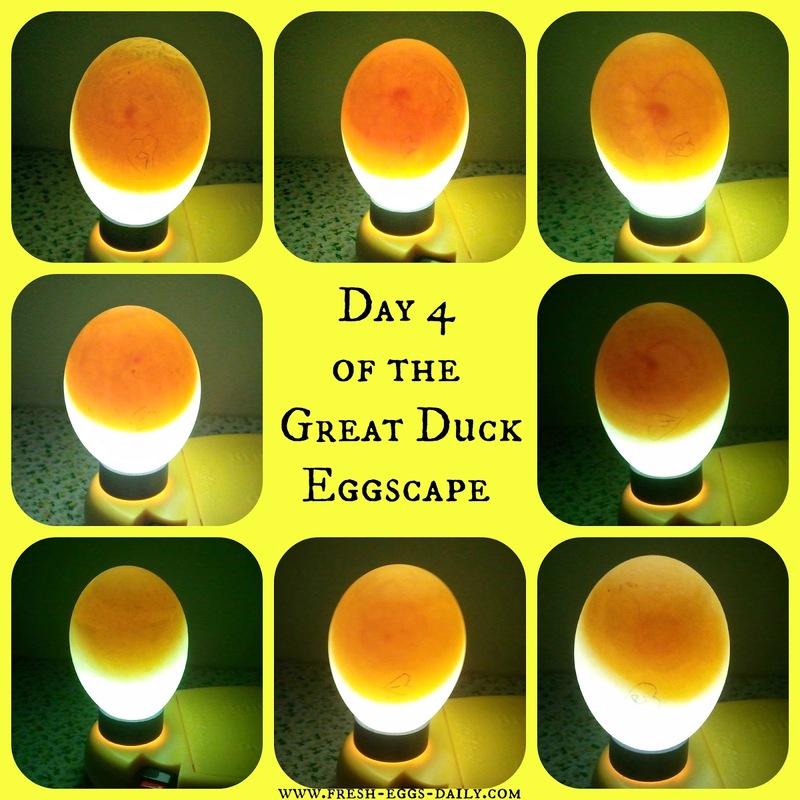 Follow along with the ducklings as they grow on our blog post HERE. 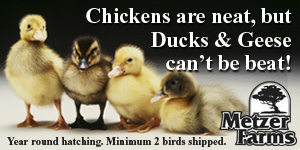 And for basic duckling care click HERE. Oh, how wonderful! I can't wait to see updates! I've heard that ducklings are harder to hatch, but we were considering giving it a try NEXT year. 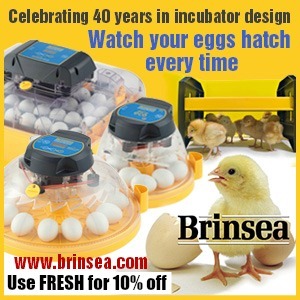 We have a really old incubator though so might have to look into a Brinsea. 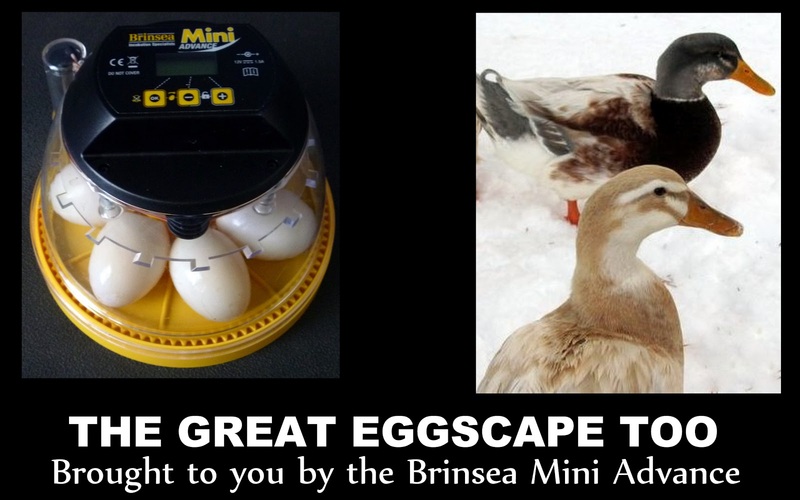 I had always read the eggs needed to be misted by Brinsea recommends instead taking to top off the incubator each day during the second half of the incubation period to cool the eggs down and mimic the mother duck getting up to eat and drink. I had always thought the misting kept the membrane moist but instead it acts to cool the eggs off. Looking forward to seeing these little guys and girls! Oh me too ! 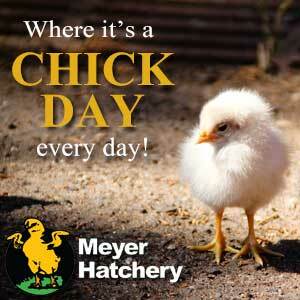 I have been looking for Saxony hatching eggs for awhile now and am really excited ! I've always wanted to try duck eggs. I have 7 dozen chicken eggs in my GQF incubator right now. I do staggered hatches, so I have chicks hatching every week. Wow ! What do you do with them all ? 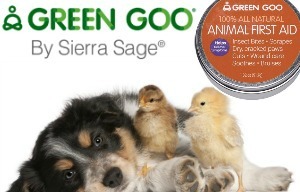 I just got my first incubator and fertile eggs coming in tomorrow. I'm going to give this hatching thing a try. I've got 10 LEghorn chicken eggs coming. I hope I can get at least a couple to hatch. I'm so very excited!!!!! I don't know how I managed it, but when I was 12 I hatched several duck eggs with a desk lamp and a heating pad. I don't remember keeping track of the temp, humidity, etc. I didn't have the internet at that point. These incubators are awesome. There but by the grace of God were my little ducklings, LOL. What a beautiful memory ! Pretty amazing considering all the bells and whistles some of the incubators have on them ! Great job ! So fun! I can't wait to follow the progress!! 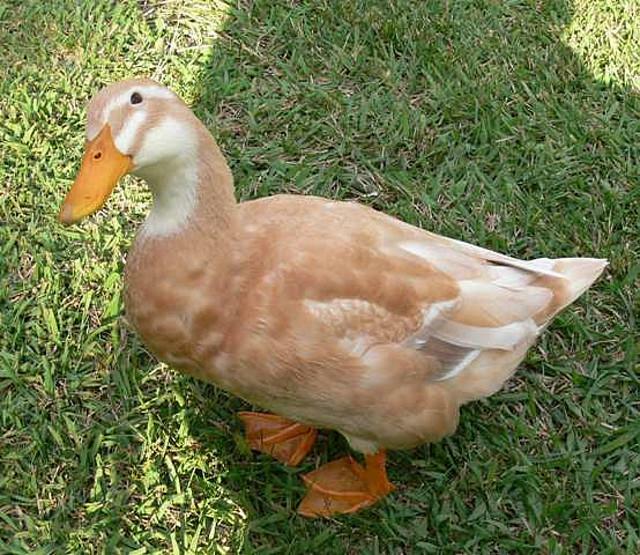 I have 10+ Ancona duck eggs coming to me next week. 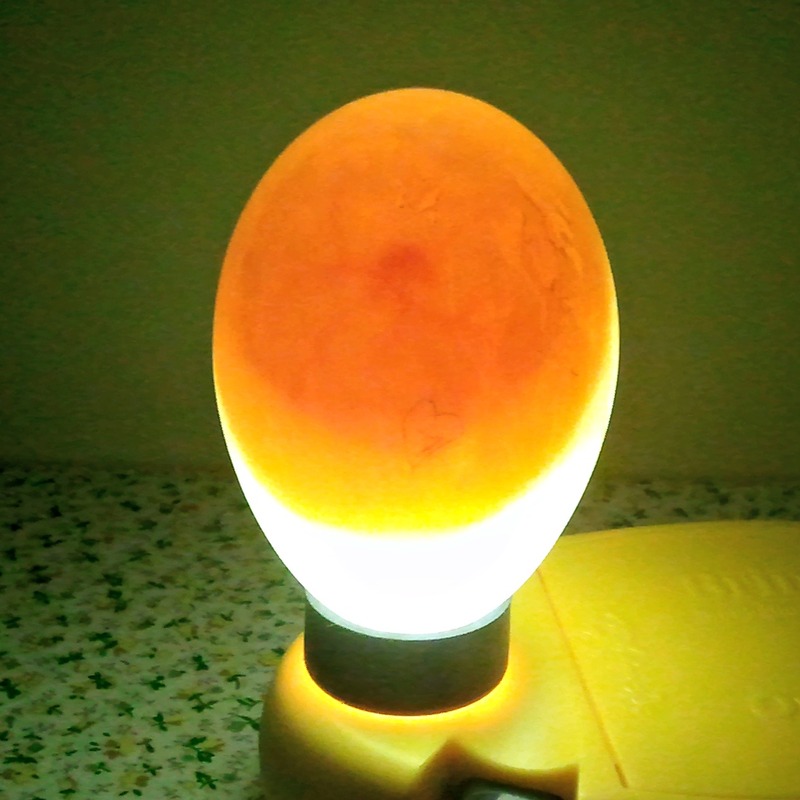 It will be my first time incubating eggs, so this was very helpful to me. 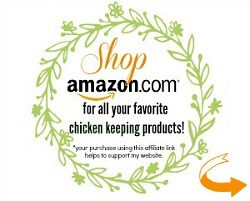 This poultry thing is addicting. I got my first chicks in March, added turkey poults last week, and now it will be ducks! Audrey here, I can't wait to see these little ones! I love their coloring! I got my first ducks this year at one week old. 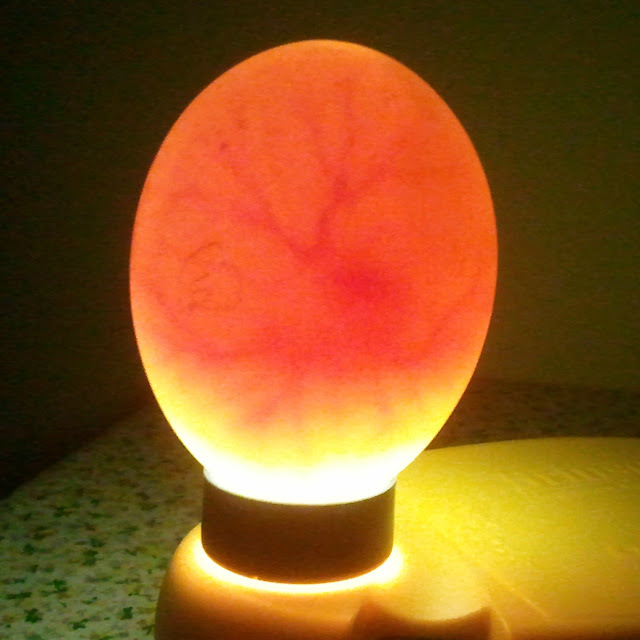 I want more and hope to hatch them in my onw incubator someday. I too can't seem to get the "Comment as" to show who I am. I post through FB not any of the other options liste. I LOVE ducks!!! I can't wait to hatch my first ducks!!! I just have to get a male duck first! Great Idea using the rubber shelf liner!!! How well does the light you use work on dark colored eggs? It's me, Shellie Werich, fan and member from facebook .. wish I could figure out how to not be anonymous. I think you have to have a gmail account in order not to be anonymous. I know I had to set one up in order to create the blog.. Anyway, the light doesn't work that well on the really dark eggs...works great on the duck eggs tho ! I'm excited about being able to see development soon. Good luck on the hatch! wow...this is the first day i've been able to post...everyday i've been reading...so looking forward to the ducklings.. I'm really excited for you! Can't wait to see those babies! Wish I could have ducks too, but way too noisy for my little backyard. My neighbors would be after me for sure! I love these ducks color! I pick number three. (I have three kids.) I would name one Raine after my youngest daughter. She loves to sit and watch our ducks. She has them eating out of her hand. # 2 I think will hatch name it Aflac! I'm thinking lucky #2's gonna hatch first! I would name it Charlie! Number five... yep, thats the one, and the name is Hansel or Gretel! I got it wrong with the chickens... maybe this is my time! Audrey here! Number 5...name...Daffy or Daffnie. #3 is the lucky egg and I'm the lucky winner. So let's name the ducky, LUCKY!!!!! You are a fantastic incubation nurse mom! I learned a lot from reading your post. 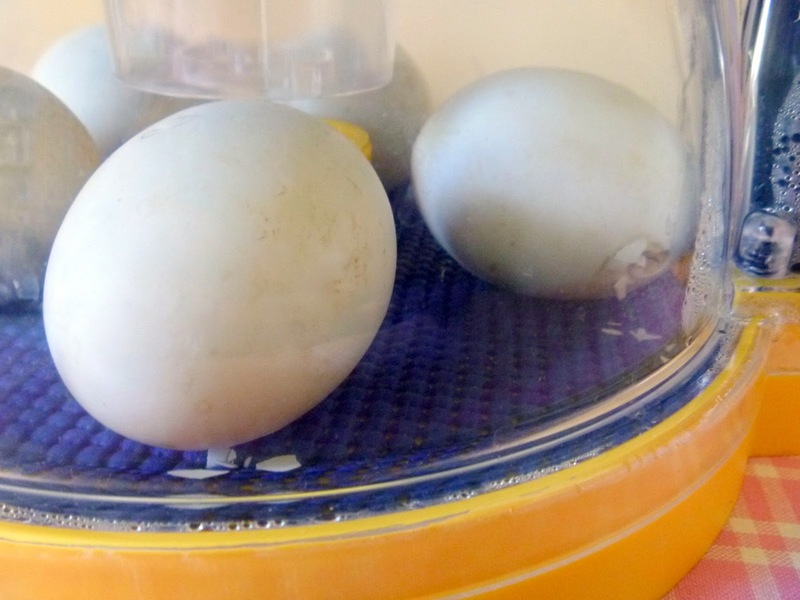 My 13 year old daughter hatched out 10 Mallard eggs in the incubator (8 first run and 2 second run)for her 4-H project. She only turned them twice a day and did not mist them or cool them down. It's interesting to see how others are doing it. What you are doing makes a lot of sense, but it sure does take a lot of dedication. I have no idea which egg will hatch first...I'd love to win the shirt for her though! She also let mom hatch 8 eggs so now we have 18 ducklings and the parents...she will sort through them in a month and decide which ones she will take to fair and to shows this fall and which ones she will be looking for new homes for. I'll wait to pick a 1-5 number until I see if you post any more pictures of the candling...1 in 5 chance of even being in the drawing is not that great...I may have to contact Louise's Country Closet and just order a shirt! :-) Thanks for the great blog post! Hi, I have a pair of Saxony ducks. the hen has been sitting for about 20 days now solidly on 14 eggs, but i am a bit worried that there may be no ducklings at the end of her lenghty sit. We have had some terrible rain and at the beginning she kept leaving the eggs and they must have got terribly wet. Having said that she has literally not left them at all for about the last 2 weeks. Do you think they will hatch?? i am hoping that her instinct is telling her to continue to sit and she will be suucessful. 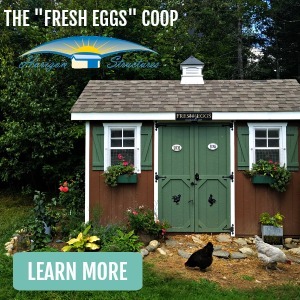 If they are anything like chickens, she knows if they are not developing and will kick any out that aren't fertile or that aren't going to hatch. 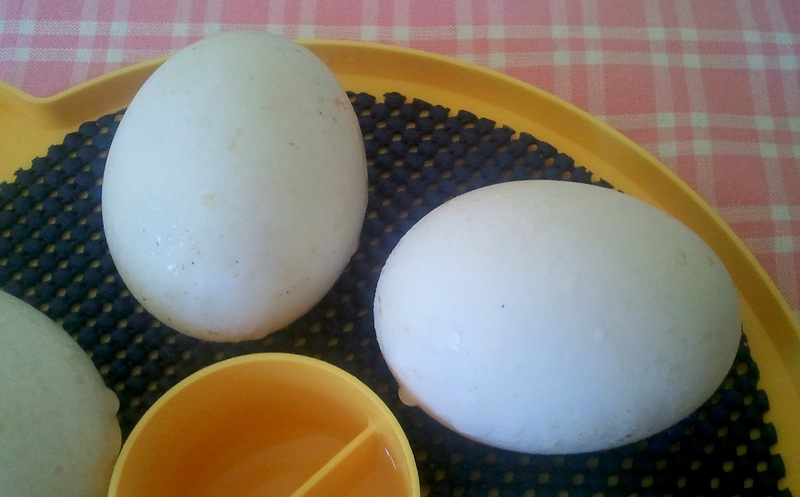 Ducks generally lay their eggs in a damp spot, and it is suggested to mist duck eggs in an incubator so I would guess they are fine. Momma knows best right ? 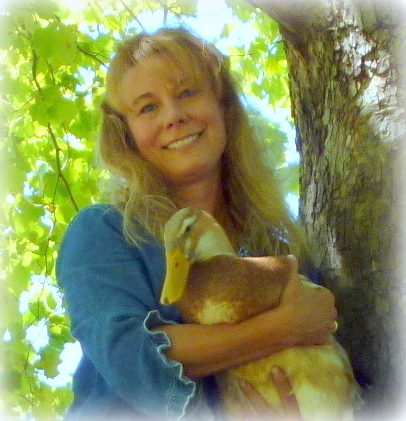 I hope you are a fan of Ducks Too www.facebook.com/DucksToo and that you will keep us updated AND post baby photos ! Been thinking about adding ducks to our farm for a while. After reading this I just might have to. You've got me all anxious for the hatch date. I'm thinking egg #4 will hatch first. How about Leif for a name? It's Emily. 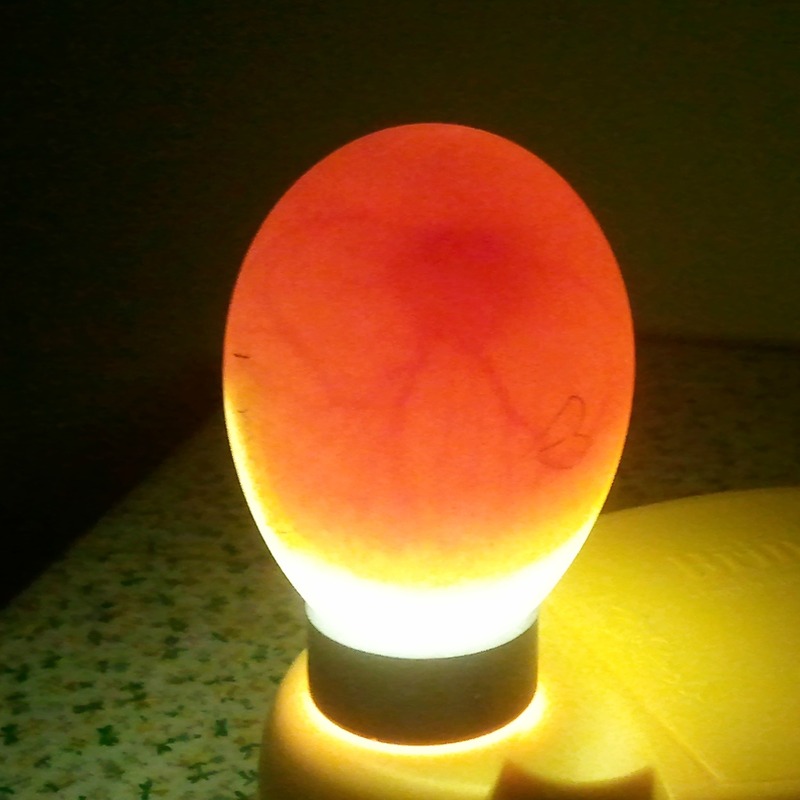 I think egg number 1 will hatch first and you should name him Quackers. I think I will pick number 4. I love ducks. Audrey here, Come on Number 5!!! This is so neat! Come on 5 you can do it!!! I vote for number three!!! 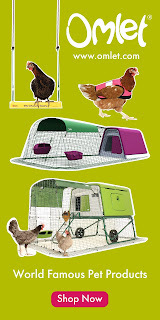 Emilee38449@yahoo.com ... Good luck btw I am also going into lockdown to more with my Muscovy eggs! Best wishes for your hatch and c'mon number three! wooo hoooo ducklings!! great mom you are. lisa!! This has been a wonderful journey and I have read every word, loved every photo and cheered along with you. I have been rooting for number two to go first but what a great pic of that first eager baby! That was a fast hatch! Watch that one... its going to be a doozy, I just know it! Congrats on the great success and your diligence. I appreciate what you do and share. Barb ! You voted for #5 and that was the first one ! You won a t-shirt ! 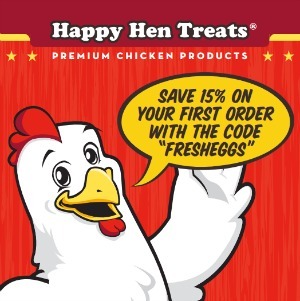 Email me at fresheggsdaily@gmail.com your mailing address so I can get it out to you. Nice job - and thanks for this sweet note ! Love the dog. Reminds me of our late shepherd, Ashton.